Merrylin only recorded one remaining species of Draco Alatus, although with further research and fossil evidence, he was able to ascertain a number of subspecies within the genus Draco . They were distinguished by a number of anatomical traits, most noticeably coloration. Draco Alatus were very large, pale, with black stripe-like markings covering their entire bodies. Wyverns, or Draco Minor were much smaller, with distinct dark red markings on their faces, and an extra digit on each wing. According to legend, Wyverns were distinguished by the absence of secondary forelimbs – the front limbs forming the wings, where as Dragons (Draco Alatus) were imagined to be quadrupeds, with a third pair of arms forming the wings. There are no known species of non avian or avian dinosaur with such anatomy, and therefor this is either a complete fabrication (one of many thousands that litter legend and mythology) or a Draco Alatus was once born with this malformation of the limbs and due to this, may have fallen foul of humans far more easily than its kin, becoming the linchpin of many a dragon slayer story. Dragons were usually caught using bait and net tactics and were extinct in most parts of the world by the 12th century. 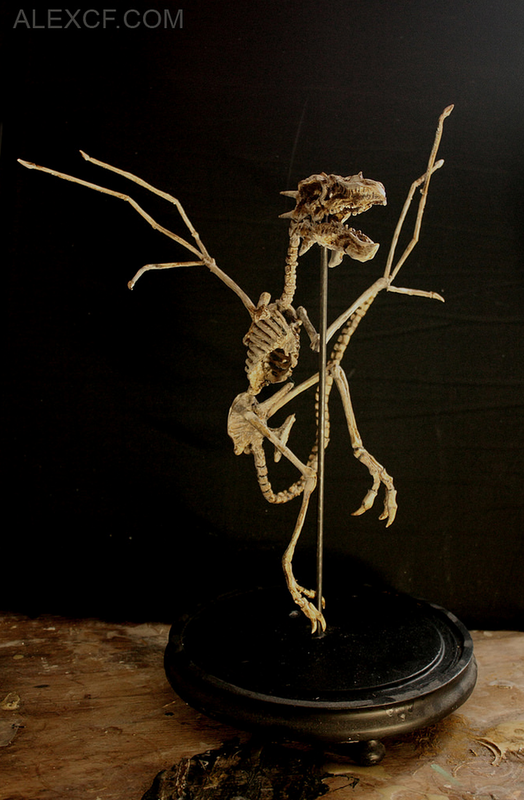 This Wyvern skeleton was hidden away in the annals of the Vatican for over 250 years, only released after Merrylin bribed his way into the secretive enclave where many a heretical artefact was concealed from the masses. Merrylin left with treasures unimaginable, including our small friend here. The Wyvern is presented in a fine victorian glass dome, wings displayed. It is almost complete, missing only a few bones.